The folly of the mean – Why do they differ so? A few years ago I did a small study where we combined a ketogenic diet with resistance exercise . After 10 weeks the 8 women in the diet group experienced a mean weight loss of 5,6kg. DEXA-scanning (Dual Energy X-ray Absorptiometry) showed that the mean fat mass loss was 5,6kg and that the fat free mass was unchanged. But, it would be wrong of me to say that this strategy conserves lean body mass, because the truth of the matter is that it all depends. Because 4 of the women in the diet group increased lean body mass, while 4 lost some despite the 10 weeks of resistance exercise. The individual results from the study are illustrated below. As you can see, there are large individual variations. But individual variations are often not presented in scientific articles. Instead we are given results as means, and the means do not tell us what happens at the individual level. Of course, results also commonly include a measure of variation such as standard deviation (SD) or confidence interval (CI), but that still does not tell us what the true variation was and exactly how the different individuals responded. And this is the trouble with presenting study results as means; there are always individual variations and the funny thing is that it is usually these very variations we really want to understand. Exercise studies are good examples of how misleading averages and means can be. Generally speaking we have to say that exercise at best is a very poor weight loss strategy. The reason is that exercise studies rarely yield weight loss of any significance. Even if we didn’t have exercise studies we would still know that exercise does not make us lean, because we all know that our body weight does not change with changes in exercise volume. My body weight is practically constant, no matter how much or how little I exercise, and most people seem to be like me. Of course, if we do resistance or strength training we will build muscles, and often gain weight, but there is just no obvious link between energy expended during exercise and concomitant weight loss. However, if we look closer at exercise studies it may seem that it is possible to lose weight from exercising, but that it doesn’t happen to all of us. Take for example a study lead by Neil A. King at Queensland University of Technology . Fifty-eight overweight and obese men and women completed 12 weeks of supervised exercise in a laboratory. The exercise sessions were designed to expend 2500 kcal/week and involved exercising at 70% of each individual’s maximum heart rate for 5 days a week. The aim of the study was to assess the effects of 12 weeks of mandatory exercise on appetite control. About 22 of the participants, or roughly half, lost more weight than the mean. And 10 participants gained weight. So the really interesting question is; what is the cause of the difference in the individual responses? Although the mean weight loss was small and likely affected by non-exercise factors the above results do not exclude the possibility that some of these people lost weight simply by exercising and without significant changes in other lifestyle factors. In fact the very statement that I usually make, that exercise does not cause significant weight loss, is based on results given as means. But what if there’s always responders and non-responders equaling each other out? Still, we need to remember that if exercise by itself caused some of the people in the King study to lose weight, it is more likely because of factors such as reduced insulin resistance, reduced glycogen stores or improved fat metabolism, than because of increased energy expenditure. Diet studies are also hard to interpret based on results presented as means. The Look AHEAD (Action for Health in Diabetes) [3,4] documented the effect of a traditional lifestyle intervention on overweight and type 2 diabetics. More than 5000 overweight men and women were randomized into an intensive lifestyle intervention group (ILI) or a control group that only received information and support. The study lasted 4 years (this is a gigantic study and one of very few randomized controlled trials of this size) and the goal of the ILI group was to achieve a 7% weight loss and to maintain the loss throughout the 4 years. The participants in the ILI group were asked to eat 1200-1800 kcal per day of which less than 30% was to come from fat. In addition the goal was to exercise 175 minutes per week, and they participated in regular group and individual counseling. All in all, the researchers did all they could to make sure the participants lost weight. After 4 years of dieting the mean weight loss in the ILI group was 4,9kg or 4,7% of baseline body weight. The below graph illustrates that many achieved a great weight loss after 1 year, but as the study progressed, the participants gradually regained their lost weight, and if the study had lasted any longer the mean weight loss would probably have been even smaller. But once again the mean results don’t really tell us much. Wadden and coworkers reveals that only 74% of the participants lost weight and that the remaining 26% gained weight. Only 46% lost more than 5% of initial body weight (which was 95kg in women and 109 in men, so roughly 5kg), and only 35% lost more than 7% of initial weight. With so much effort in so heavy people these results are a strong indication that traditional dieting simply does not work. But once again we need to ask what the difference between the participants who lost a lot of weight and those who lost little was. This is the really important question, and a question that is asked to rarely. Those who continue to cling to the old dogma might say that those who lost the most weight probably were those who followed the given advice the most and that those who lost little did not do as told. And they might be right. But we need to know. We can be pretty sure that many of the participants did not do as told and that many did more. That’s just how people are and had this been a smaller and more tightly controlled study, anyone who did more or less than asked would have been excluded from the analysis. But there might also be large individual variations in response to the same intervention, and once again it is these variations – the reason we respond differently to the same stimuli – we truly want to understand. One way we sometimes try to shed light on some of the individual variations is to do correlation analyses. For example, if in the above study, there was a strong correlation between protein intake and weight loss, then differences in protein intake was probably an important reason for the individual variations. But the ting is that we rarely find such strong correlations in weight loss studies and so we are left in the dark when it comes to understanding what biological mechanisms are hidden in the mean. Even though studies fail to elucidate the reason for individual variations, I would still like the individual results to be presented more often, because this acts as a strong reminder that we cannot truly understand the world if we cannot understand why we differ so. 1. 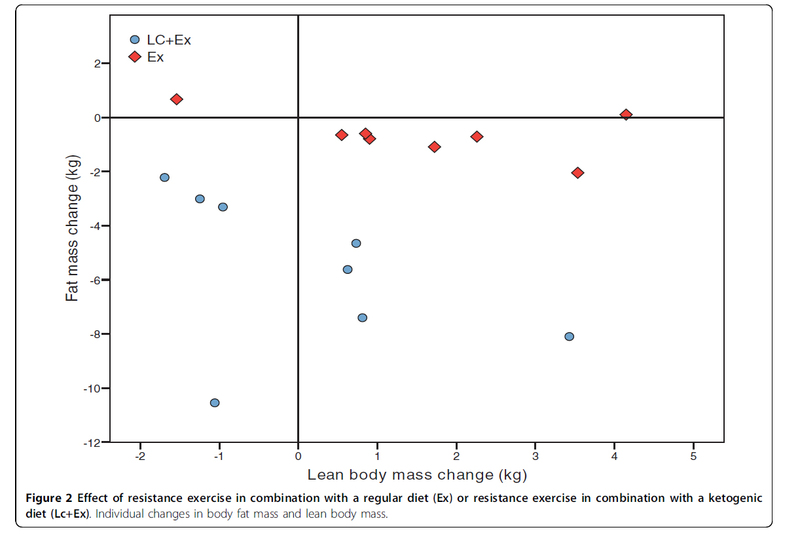 Jabekk PT, Moe IA, Meen HD, Tomten SE, Hostmark AT: Resistance training in overweight women on a ketogenic diet conserved lean body mass while reducing body fat. Nutr Metab (Lond) 2010, 7: 17. 2. King NA, Caudwell PP, Hopkins M, Stubbs JR, Naslund E, Blundell JE: Dual-process action of exercise on appetite control: increase in orexigenic drive but improvement in meal-induced satiety. Am J Clin Nutr 2009, 90: 921-927. 3. Wing RR: Long-term effects of a lifestyle intervention on weight and cardiovascular risk factors in individuals with type 2 diabetes mellitus: four-year results of the Look AHEAD trial. Arch Intern Med 2010, 170: 1566-1575. 4. 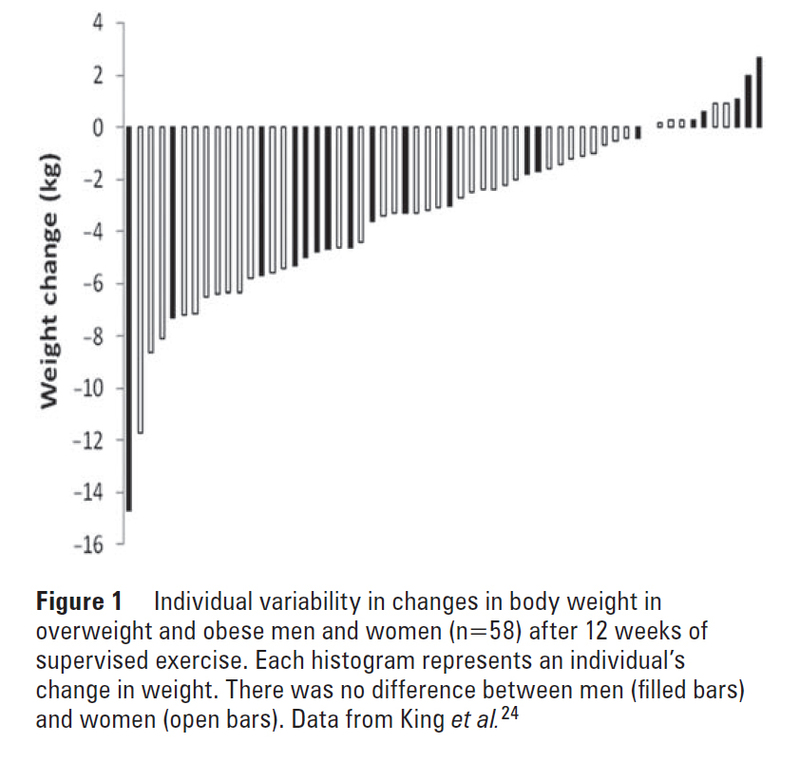 Wadden TA, Neiberg RH, Wing RR, Clark JM, Delahanty LM, Hill JO, Krakoff J, Otto A, Ryan DH, Vitolins MZ: Four-year weight losses in the Look AHEAD study: factors associated with long-term success. Obesity (Silver Spring) 2011, 19: 1987-1998. Forfatter paljabekkLagt ut på juni 12, 2012 mars 12, 2016 Kategorier exercise, http://schemas.google.com/blogger/2008/kind#post, overweight, statistics8 kommentarer til The folly of the mean – Why do they differ so?